Snowboarder Chris Hawkes from Inverness, hunting for fresh snow heading towards the top gondola station at Nevis Range, Fort William. 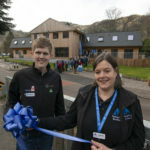 After a long-awaited start, Nevis Range Mountain Experience on the outskirts of Fort William opened its doors to ski and snowboard enthusiasts for its first official day of the 2019 season on Wednesday last week. Following one or two false starts, and after a couple of heavy snow falls and continuing cold temperature, there was at last enough of the white stuff to get the show on the road. Nevis Range’s marketing manager Nikki Stafford told us: ‘It’s awesome to finally open our doors for snowsports this season. 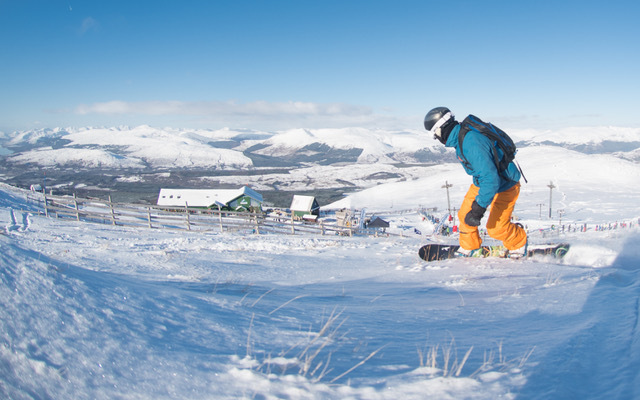 ‘When both locals and visitors get out onto the slopes of Aonach Mor, the mountain really comes alive. ‘This weekend there was certainly a special buzz around the hill that only comes when the snow falls and the runs are full of skiers and snowboarders. We are definitely looking forward to further snowfalls this week to further improve on conditions. Snowboarder Chris Hawkes from Inverness, hunting for fresh snow beside the Alpha poma at Nevis Range, Fort William. Photograph: Steve McKenna. More snow is forecast to fall across the slopes of Aonach Mor this week and into the weekend, enhancing current conditions. 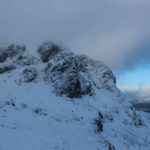 Nevis Range activities director John Sutherland added: ‘A massive effort goes in from the whole team to get the mountain winter ready. ‘When the snow falls it’s good to see everyone’s hard work pay off. Last Saturday was a great day on the hill, snow conditions were variable across the mountain – which definitely need a bit more for a powder day – with some good skiing on pisted runs and powder pockets could be found in some off piste areas. The sun was shining and we held the first round of the Nevis Range Freestyle Series. 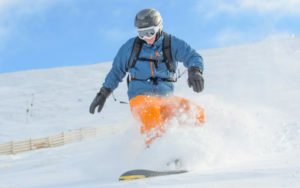 A range of fun and family-focused events will be staged at Nevis Range throughout winter 2018/19, including the Nevis Freestyle Series and the Nevis Mini Shredder Series, quiz nights, ceilidhs, food and drink evenings; together with the welcome return of Ski-an-Duro, the ‘ever so slightly bonkers’ ski/board and mountain bike race from the summit to the gondola base station.